Clean Boot is a feature of Microsoft Windows; where we disable all the third-party startup applications and then try to restart the system. This way we can perform a clean boot. Clean boot helps to identify the startup issue which might be occurred by one or many of the third-party applications. While troubleshooting startup issue; clean boot is a must to identify whether the issue with Windows files or with any third-party applications. While clean boot only Windows default startup applications will be active rest others are inactive; as we disable this. Let’s see how to perform a clean boot in Windows. These steps are almost same for Windows XP, Vista, 7, 8, 8.1 and 10. So if you using any one of the Windows OS either new or old; do not worry just follow the steps. First close all the running applications or save data before performing clean boot; because system will restart after performing further steps. Open Run » Type “MSConfig.exe” without quote » Press Enter Key. Now a new window of System Configuration will pop up. Now check all the listed services and click on Disable All. Now click on Apply then OK.
Now you will be prompted to restart the system; click on Restart button. Now the system will restart with clean system like first installed Windows. If you found that previously the system was bad and now working fine that means there is some issue with any of third-party startup application. If you know which one of third-party application is creating issue then let that disabled and start other services again. If you don’t know which application is creating issue then you can perform this small trick. 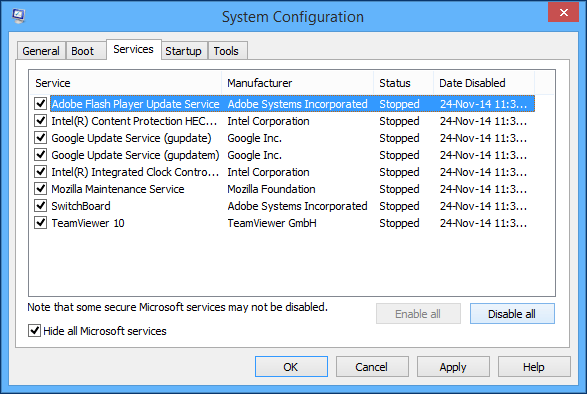 Suppose you have 6 startup services, first disable all and restart system then enable first 2 startup services, if it works fine then again enable 2 more services, if system stuck here then again disable last 2 enabled services and try to enable one each time and find which one is creating issue. How to Enable all the Disabled Services? Now check all the listed services and click on Enable All. Note: If you found any application creating issue then uncheck that after enabling all. This way you can perform a clean boot in Windows any version.